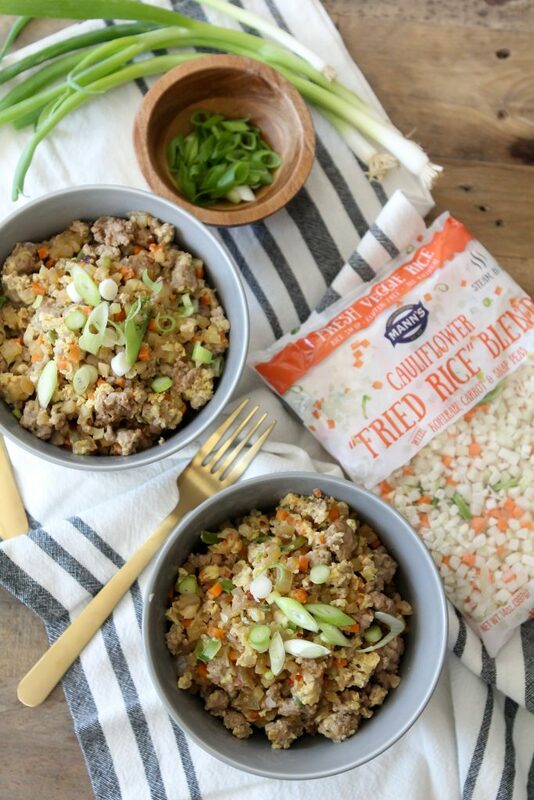 This Pork Fried Cauliflower Rice from The Whole Smiths is brought to you in collaboration with Mann’s Fresh Vegetables. 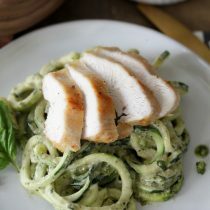 Not only is it easy and quick to make but delicious and Whole30 compliant! It’s no surprise to any of you that I am a sucker for quick and healthy food. Not to mention, I can get a little lazy when it comes to food prep. I mean, who doesn’t? 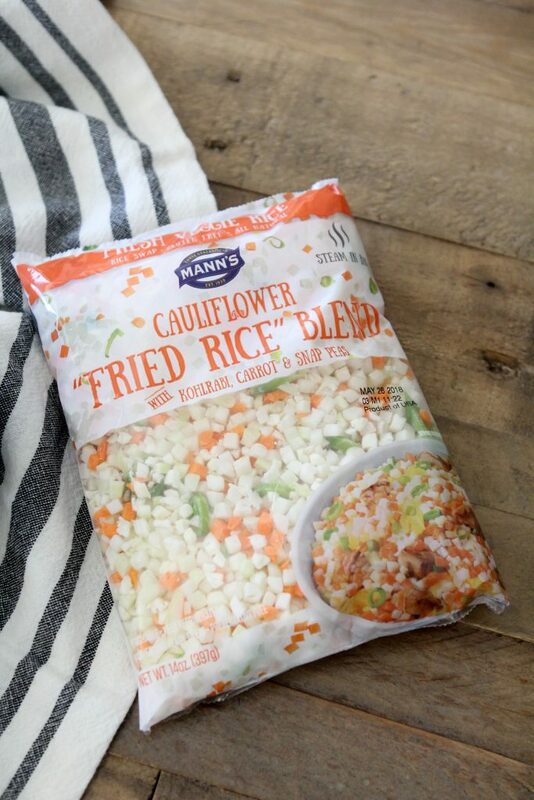 So it should really come as no surprise that I love Mann’s Fresh Vegetables. They make pre-prepared fresh vegetables accessible for all of us at a reasonable cost and are sold at a variety of retailers across the country. 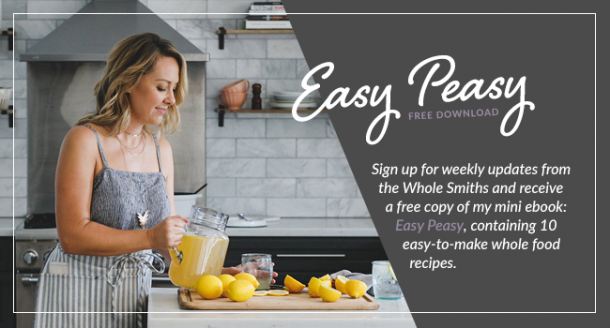 I’ve used there products in my recipes on here in the past and you have all loved them. From my Pesto Cauliflower Rice + Blistered Tomatoes to my Southwest Chipotle Bowl with Chicken, they’re all delicious. And super, easy. 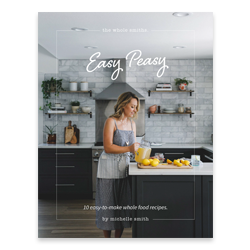 In fact, their Instagram handle is @veggiesmadeeasy because, well they ARE easy. It’s so important that when we want a healthy meal we’re able to prepared one with ease because if it takes too long or is too much effort, it’s not going to be sustainable for the long haul. 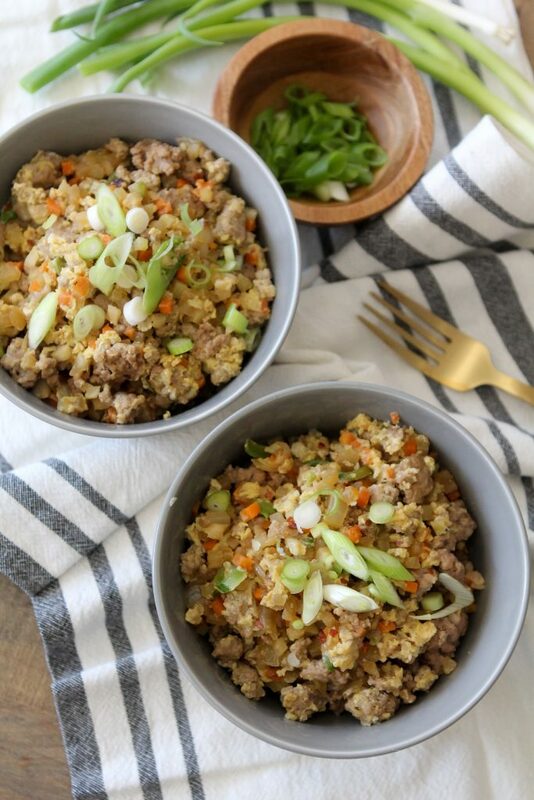 This Whole30 Pork Fried Rice is no exception to that. You can whip it up in 15 – 20 minutes, no problem. Them most labor intensive thing you need to do for it is chop up an onion and I know you can all do that. From there, there is no fancy cooking trick needed. It’s just staring and frying, stirring and frying. The only part you may get confused at it when you add the egg. But don’t worry, you can’t screw it up. I promise. Just let the egg sit there until it starts to cook and slowly stir it into the rest of the dish as it cook. That’s it. Again, I promise you won’t mess it up! I have to say, I love how healthy it is to make Asian inspired dishes at home. 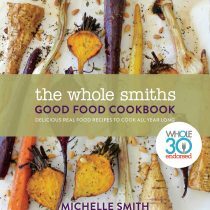 I find that so many of their recipes are naturally loaded with healthy veggies and often contain a protein. The flavors really pop and everyone loves them. One traditional flavor that I always swap out is traditional soy sauce as it contains soy and gluten. Gluten is a hard stop for me but I have small amounts of soy in my diet. Because of that, I’ll often use tamari which is a gluten-free soy sauce. Truth be told, the only soy I ever consume is in tamari soy sauce so I’m not to worried about having it in my diet. Besides, the amount of soy sauce used is typically minimal for me. If you’re doing a Whole30 or avoiding soy altogether do NOT use the tamari. Instead I suggest using coconut aminos. 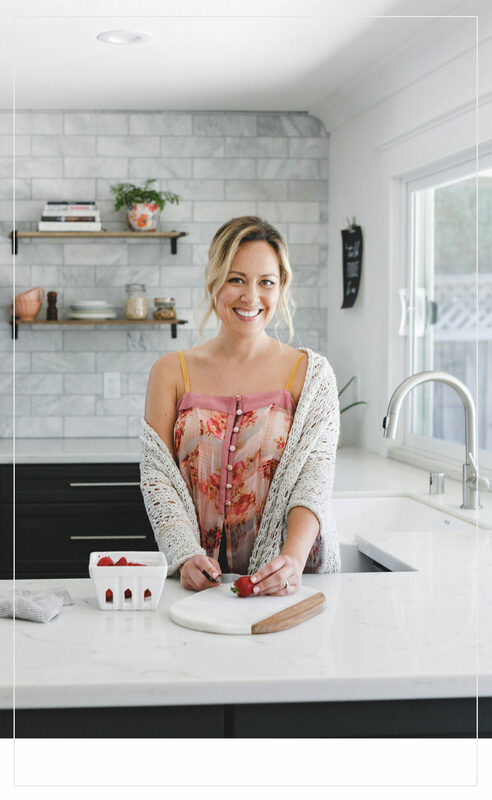 Typically I use a combination of both when I am recreating Asian inspired dishes as I love the sweetness that the coconut aminos brings to the dish. 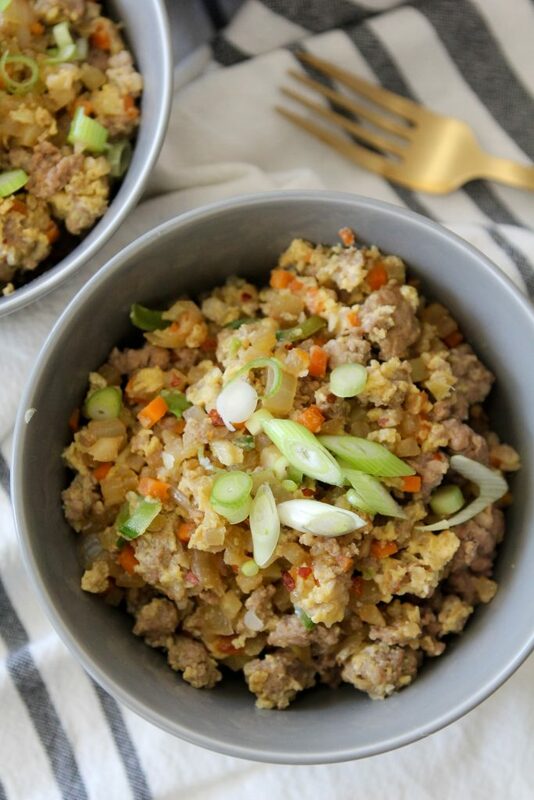 If you’d like to try out another veggie based Asian-inspired dish, I recommend Little Bits of Real Food’s Spaghetti Squash Chow Mein, you won’t be disappointed! I made the portion size to serve 4 people as a side or 2 people as a main course. However you’d like to serve it is up to you. How fun would it to be to have a “take-out” night where we make all of our favorite traditional dishes at home with a healthy twist? Anyone want to come over and cook it all up for me? Ha. I also suggest doubling the recipe for leftovers through the week as the flavors only get better. And if you want one more suggestion? Make a lettuce wrap using this as the filling! If you’d like to find more products from Mann’s Fresh Vegetables you can use their store locator here. Keep your eyes peeled next time you’re at Target, Whole Foods, Aldi’s, Costco, HEB.. wherever! Chances are you can kind them there. 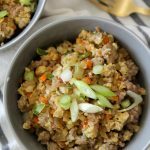 Not only is this Pork Fried Cauliflower Rice delicious and ready in minutes but it's paleo and Whole30 compliant! Add the olive oil to a large cast iron skillet (any skillet will work, but I love a cast iron one) and heat over medium heat. When the oil is hot, add the onions and sauté until the onions are softened and lightly browned, about 5-7 minutes. Push the onions to the side of the pan and add the ground pork to the pan, adding more oil if the pan had gone dry. Add 1 teaspoons of the salt to the pork. Let the pork lightly brown and continue to cook while breaking it up with a wooden spoon. 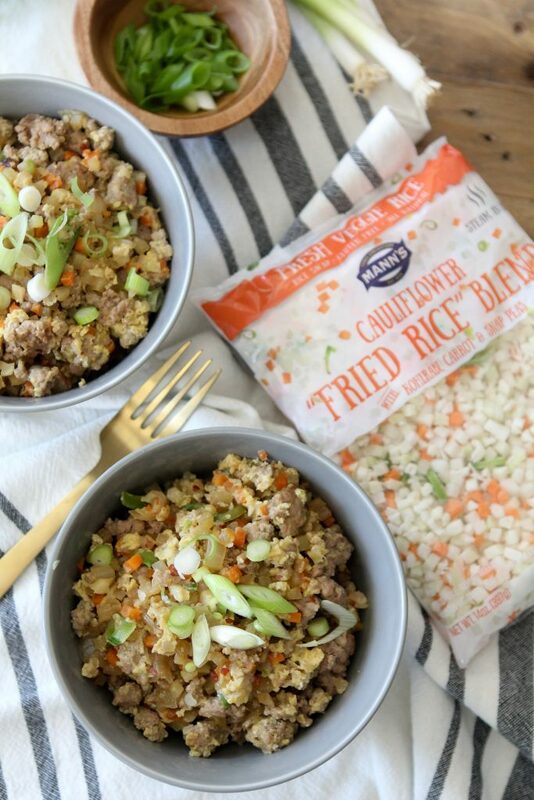 Once the pork is cooked through add your cauliflower rice to the pan and add the sesame oil, coconut aminos and or tamari soy sauce and remainder of the salt and stir to combine. Continue to cook until the cauliflower rice has softened. When the cauliflower has softened, form a well in the middle of the pan of rice and pour the beaten egg into it. 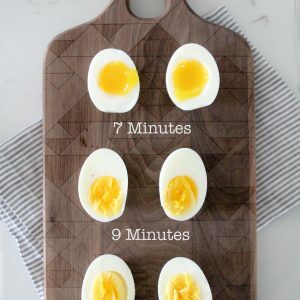 Let the egg sit until it starts to cook through and gently stir the cooked parts of the egg into the remainder of the dish. Once the egg has cooked through, stir the dish thoroughly to combine. To serve, top with sliced green onions and optional red pepper flakes.